The Bayou Classic Sportsman’s Choice Deluxe Deep Fryer Cooking Kit is one of Bayou Classic’s most versatile deep frying kits. The Bayou Classic Sportsman’s Choice Deluxe Deep Fryer Cooking Kit features all the deep frying cooking tools you need to fry and eat in style. Use this outdoor deep fryer kit when camping, RVing, tailgating or in your backyard. 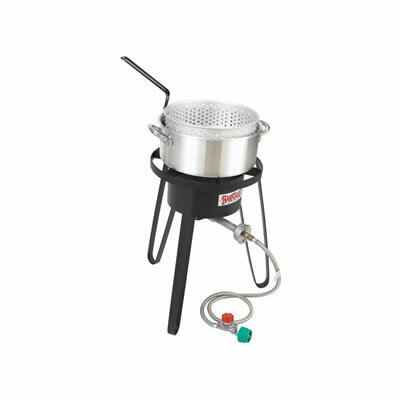 The outdoor propane burner that is included with the Bayou Classic Sportsman’s Choice Deep Fryer Cooking Kit is the Bayou Classic SP10 outdoor propane burner, which is one of the Bayou Classic burners with 185,000 BTUs. This burner heats up a pot as large as 120 quarts. Another feature this deep fryer kit has is the included extension legs. When using a larger pot, it is safer to bring your boiling equipment lower to the ground. This burner has a full windscreen to protect your flame. This complete deep fryer cooking kit is designed for strength, function and safety and is known as Bayou Classic’s most stable and efficient outdoor cooking kit. The BTUs of this outdoor propane unit reaches up to 185,000 BTUs. The fire may be turned down to simmer the smallest cup of coffee. 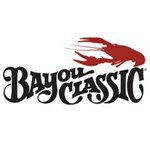 The Bayou Classic Sportsman’s Choice Deluxe Deep Fryer Cooking Kit includes Bayou Classic’s 10 quart aluminum deep fryer, deep fryer basket, high pressure outdoor propane burner with extension legs, high pressure propane regulator and hose kit.